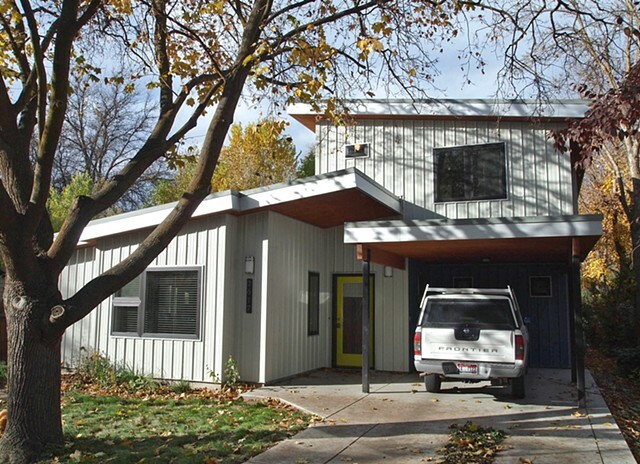 New modern residence in Boise, Idaho. The exterior is sided with ribbed metal, the interior has honed concrete radiant floors downstairs and beetle kill pine wood floors upstairs. It was designed to be energy efficient with a low maintenance exterior. The design/architecture as well as interior finishes were by Andrew Traub. Goldy from Flying Cowboys Construction was the contractor.